What is scaphoid nonunion? 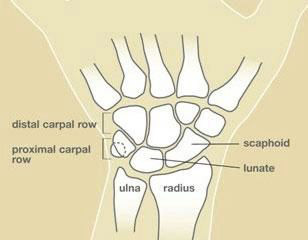 The scaphoid bone is one of the eight small bones that comprise the wrist joint. The two rows of small wrist bones act together to allow the wide variety of wrist positions and motions that we take for granted. The scaphoid bone spans or links these two rows together and, therefore has a special role in wrist stability and coordinating wrist motion (see Figure 1). The scaphoid bone is vulnerable to fracture because of its position within the wrist and its role in wrist function. When the scaphoid bone is broken, it may not heal properly because it has a very fragile blood supply. Scaphoid fractures that do not heal are referred to as a scaphoid nonunion. 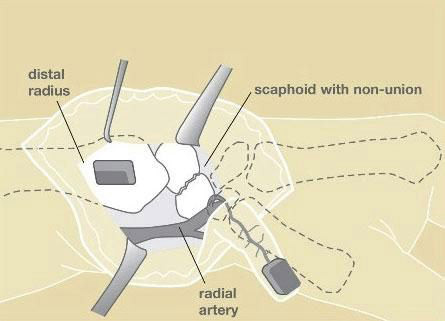 Ultimately, scaphoid nonunions can lead to loss of wrist motion and eventual wrist arthritis. Diagnosis of scaphoid nonunion Patients with a scaphoid nonunion usually present with a history of previous wrist injury, especially a fall onto an outstretched wrist. They will typically have pain along the thumb side of the wrist and may also have diminished wrist mobility, particularly wrist extension. Scaphoid fractures and nonunions are usually confirmed by xrays of the wrist (see Figure 2A and 2B). In many cases, special xray tests are also used to decide the best treatment approach. A CT scan is helpful to check for collapse of the scaphoid on itself, resulting in a bend in the bone, which is called a “humpback” deformity (see Figure 3). 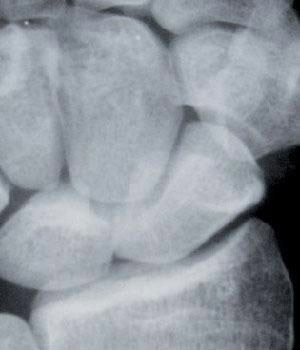 Scaphoid nonunions may also develop a problem called avascular necrosis. 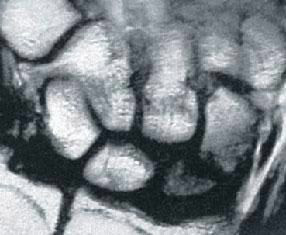 Avascular necrosis occurs when part of the scaphoid bone dies because of the loss of blood flow. This can eventually result in fragmentation and the collapse of the bone. Its presence also makes repair of the scaphoid much more difficult. An MRI scan can be helpful to check for avascular necrosis (see Figure 4). Treatment of schaphoid non-union Treatment of a scaphoid nonunion is dependent upon a variety of factors. Once a scaphoid fracture has failed to heal, a relatively predictable pattern of degeneration within the wrist generally occurs, although the time frame is variable. In most cases, the scaphoid eventually collapses, which results in a change in wrist mechanics that leads to motion loss and arthritis. Depending upon the stage of this process at which the nonunion is recognized, various treatment alternatives exist. In cases without significant arthritis, surgery to restore scaphoid alignment and heal the bone is preferred. 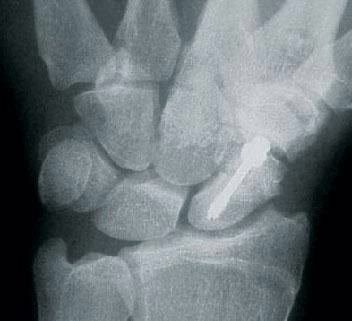 This usually requires placement of a bone graft and some type of internal bone fixation, such as pins or a screw (see Figure 5). Scaphoid nonunions with avascular necrosis present special challenges to healing since part of the bone is dead. Recent techniques using bone grafts with an attached vessel to maintain blood supply (vascularized bone grafts) have improved our ability to heal these difficult conditions (see Figure 6). 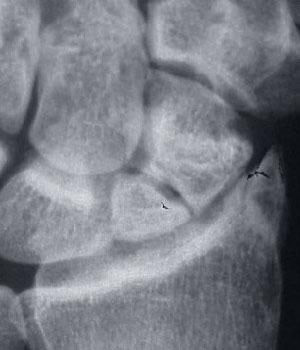 Despite optimal treatment, some scaphoid non-unions still fail to heal. Finally, in cases with established arthritis or failed reconstructive efforts, surgery to heal the scaphoid is often no longer an option. In these cases, surgery is tailored towards pain improvement along with maintaining a functional wrist. Depending on the degree of arthritis, surgery may include techniques that spare motion, such as radial styloidectomy (removal of a local piece of arthritic bone), partial fusion of the wrist bones, or proximal row carpectomy (removal of the proximal row of wrist bones). If the arthritis is more widespread in the wrist, complete wrist fusion may be needed. Patient education information provided by the American Society of Surgery of the Hand.